What might explain the variation in ASD prevalence within Canada’s borders? … autism prevalence is highest in the Canadian provinces that also have the highest vaccination coverage. NASS compiles administrative data from the health, education and social services sectors for children and youth (aged 5-17 years) who have a confirmed ASD diagnosis. Seven of Canada’s 13 provinces and territories provided information for 2015, including six provinces (British Columbia, New Brunswick, Newfoundland and Labrador, Nova Scotia, Prince Edward Island and Quebec) and one territory (Yukon). 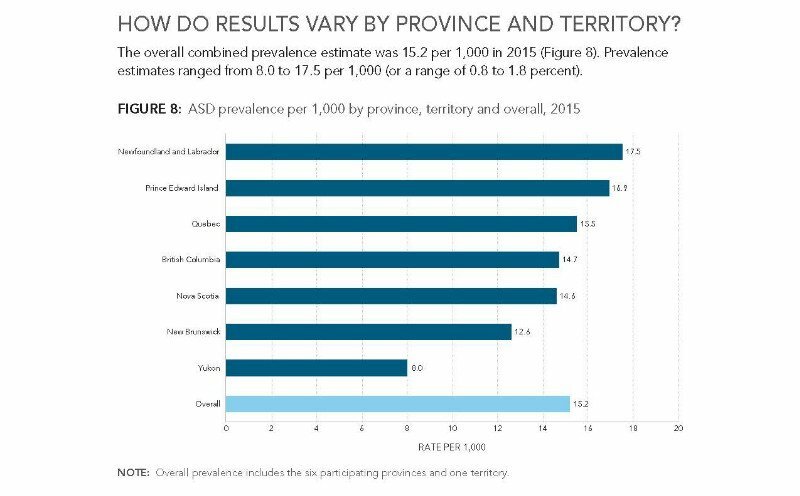 As the figure below shows, ASD prevalence in 2015 varied among the seven regions, with the highest prevalence noted in the three provinces of Newfoundland and Labrador (1 in 57), Prince Edward Island (1 in 59) and Quebec (1 in 65). In comparison, prevalence was substantially lower in the Yukon territory (1 in 125). What might explain the variation in ASD prevalence within Canada’s borders? The NASS report does not offer any comments. However, an observant health practitioner in British Columbia has noticed a compelling parallel: autism prevalence is highest in the Canadian provinces that also have the highest vaccination coverage. This evidence comes from a 2013 survey carried out by the very same Public Health Agency of Canada, which examined vaccine coverage by province/territory and type of vaccine (see table). The survey showed that coverage by age two was generally lower (with a few exceptions) in Yukon territory than in the three high-autism provinces. 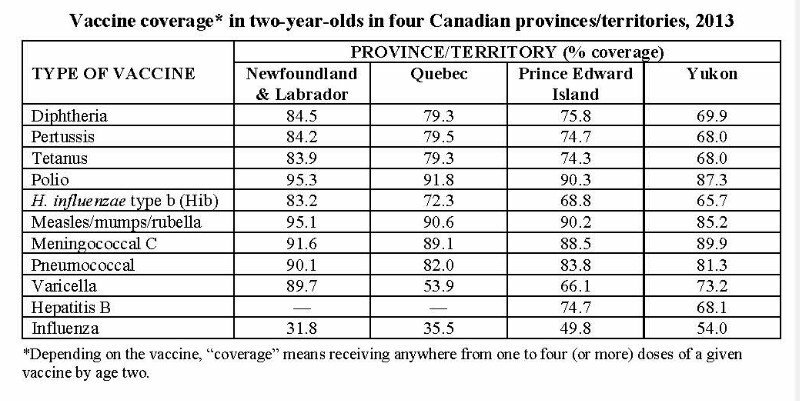 For Newfoundland/Labrador and Quebec, the percentage point difference in vaccine coverage was anywhere from five to fifteen percentage points higher than in Yukon; Prince Edward Island’s lead in vaccine coverage compared to Yukon was less substantial. Any researcher worth their salt knows that while correlation is not the same as causation, a plausible association between two variables is often an important clue worth investigating. The substantially lower ASD prevalence in a region that happens to have markedly lower vaccine coverage is one such clue. Another strand of evidence that simply cannot be chalked up to coincidence are the tens of thousands of parental reports of children regressing into autism after receiving one or more vaccines. Unfortunately, Canadian parents who suspect that their autistic child was vaccine-injured have nowhere to turn, because Canada remains “one of few western countries that denies the reality of vaccine injuries and provides no avenue whatsoever to compensate vaccine injury victims and their families.” It would behoove Canada’s public health officials to take a closer look at their own data and start taking meaningful steps to prevent the country’s ASD numbers from climbing still further. Note: The CDC is due to release its latest ADDM surveillance numbers for the U.S. Will our federal health agencies continue to downplay the numbers’ significance, as they have done each time the data show a rise in ASD prevalence? Or will they finally sound an alarm and make it a top priority to find out what is causing this epidemic in our children? Thank you Gyan for your kind comment. We have been “hammering” this subject for some years now. People are finally starting to wake up on a global basis as to the toxins being pumped into our bodies via the air, food, water and vaccinations to name a few. It is all part of the Agenda set by the World Elite to maintain population control. As the grandfather of a vaccine inured grandchild and the friend of someone who lost their infant child following vaccination I applaud TLB for bringing this injustice to the public awareness.